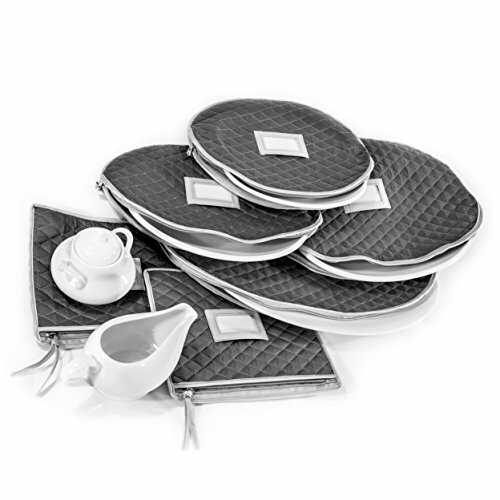 CONTENT: Quilted cases are perfect to store special fine china. 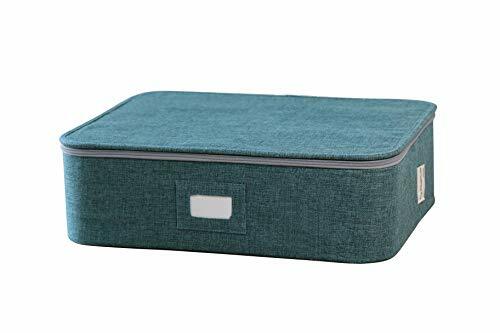 Each measures: 2 rectangular cases 9" X 10"; 1 extra-large case 20" X 15"; one large case 16" X 12"; one medium case 15" X 10" and one small case 13" X 11". PREMIUM MATERIAL: Made from premium polyester with non-slip texture with label holder to easily identify contents and zippered closure to keep your fine china away from dust, breakage and pests. CARE: Wipe with wet cloth as needed. CONTENT: Quilted case is 16" W X 13" D X 10" H. Each inside compartment is 4" X 4". 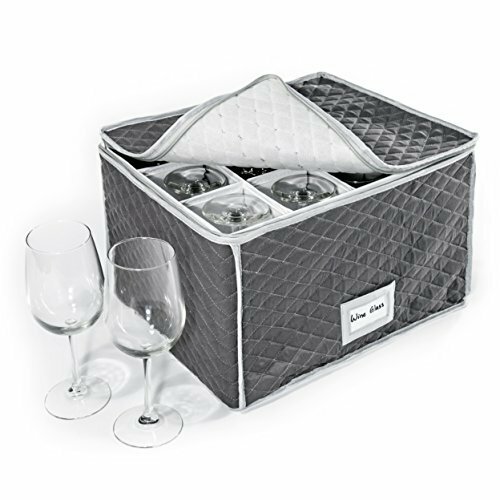 It can hold 12 glasses or mugs up to 10" tall and 4" wide, and includes removable dividers for protection against chipping and scratching. Perfect for beer mugs, pilsner glasses, pint glasses, tulip and thistle glasses, goblets, chalices, beer steins, weizen glasses and more. PREMIUM MATERIAL: Made from premium polyester with non-slip texture with label holder to easily identify contents and zippered closure to keep your fine china away from dust, breakage and pests. CARE: Wipe with wet cloth as needed. 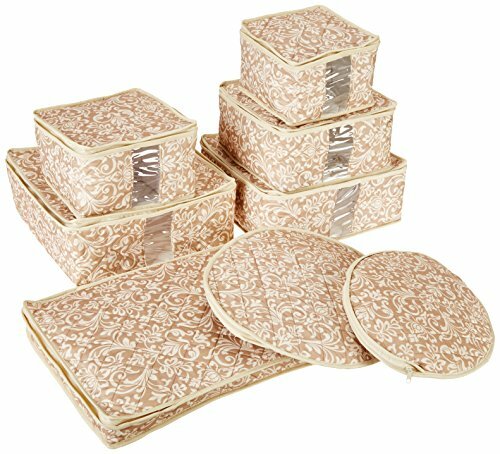 Buy this beautiful 8pc storage set to protect your dishes! It is made out of a soft quilted microfiber which is soil resistant. It is quilted for extra protection and includes plate dividers with full perimeter zippers. 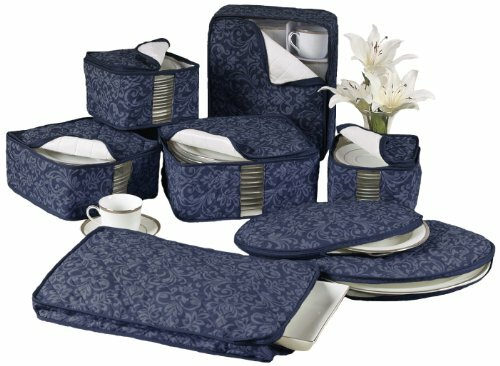 Buy this beautiful 8pc storage set to protect your dishes! It is made out of a soft quilted microfiber which is soil resistant and durable. It is quilted for extra protection and includes plate dividers with full perimeter zippers. Want more China Accessories similar ideas? Try to explore these searches: White Cork Flooring, Natural Oak Pub Swivel Stool, and Ultra Liner Liquid.